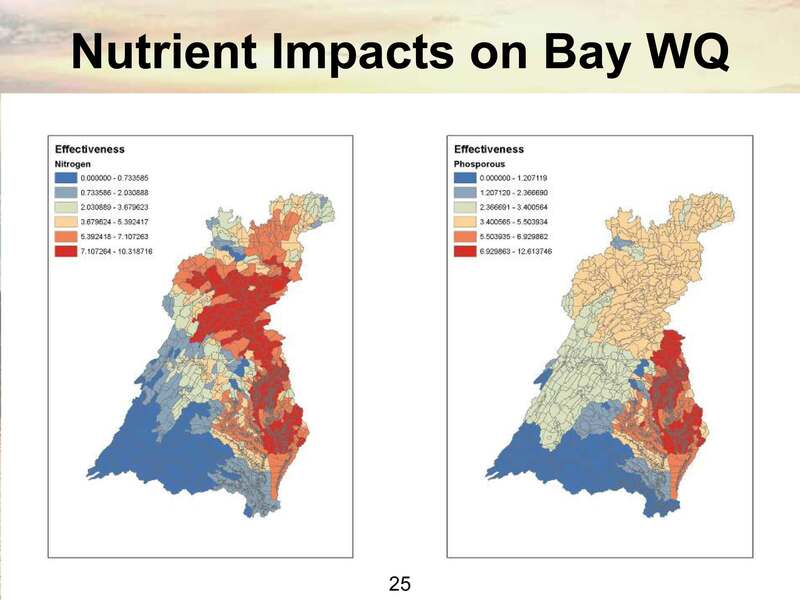 When the EPA distributed the attached EPA load map for the Chesapeake Bay last Fall, it was apparent that there were two distinct areas of excess nutrient both nitrogen and phosphorous. One was what I would call the chicken corridor which extends from Lancaster PA to the tip of Delmarva where both nitrogen and phosphorous are shown on the chart in deep red and the other is the large area of Pennsylvania which appeared to be centered in a remote area at the headwaters of Penn’s Creek and which extends SW and NE up into the State of NY. USGS does regular monitoring of the Delmarva Peninsula. Their studies show that 94% of Delmarva nitrogen pollution comes from chicken production, 59% from grain feed production, and 35% from CAFO chicken house manure. While the chicken corridor extends down the Eastern edge of the watershed it does broaden out to the West and includes part of the urban areas of Washington and Baltimore. This corridor continues down the East coast and includes the chicken and hog CAFO’s in all Coastal plain areas down to the Gulf of Mexico. The Pamlico Sound in NC is as polluted as Chesapeake Bay. Georgia and Alabama each produce double the number of chickens as Delmarva. These sparsely populated areas get little attention compared to the Chesapeake. “The poultry and hog industries are structured very much the same way (as Delmarva) where:The integrators own the animals and farmers own the risk, and at least some of the benefit, or else they wouldn’t do it. Another party involved, however, are the lenders who loan money to the farmer to build the facilities based on the confidence they have in the cash flow from the contract. Oddly enough — no big surprise really — the integrators often deem the facilities to be out-of-date and in need of repair/replacement, just as the mortgage runs out and the farmer actually owns the building outright . . . then he takes out another mortgage as a condition of renewing a contract (but you also see a lot of these outdated facilities sitting empty around the countryside). The major integrator in this area is the Clemens Family Corporation, DBA Hatfield Quality Meats and Country View Family Farms. The dairy industry is very different. The “integrators” don’t actually own the animals . . . they don’t need to, because we don’t actually eat the animals except as a final byproduct. They own the milk, however, in the sense that many farms have limited options as to where they can ship their milk, a highly perishable product (reduces farmers’ market power). There are production contracts being used, but every farmer is more or less beholden to the co-op that picks up their milk, and prices are often set in very complicated ways that farmers don’t totally understand. It’s the dairy industry that creates the demand for corn/alfalfa stripfarming that occurs, and most of that corn is processed for silage while still green. In contrast, not all but much of the grain used for poultry and hogs is shipped to the area from the Midwest, creating the basic imbalance that has disturbed the Chesapeake Watershed so greatly. To keep things in balance, we should be shipping the manure back to the geographical areas where the grain (including especially soybeans too) were produced. Instead, we ruin our watersheds with the excess manure, and farmers in the Midwest ruin theirs with the excess synthetic fertilizer needed to keep that grain growing (because they don’t have enough manure to maintain fertility). One option the EPA has is to simply say that nutrients shipped into the area must not exceed nutrients shipped out,. It’s an elegant, but very controversial idea . . . would likely end conventional agriculture in the Mid-Atlantic as we now know it”. The late Lester Lanyon a soils scientist at Penn State University extensively studied nutrient imbalance both between individual farms and on a regional basis. A summary of his research can be found by clicking the above link to the Bay Journal archives. So the big picture is that we have major geographic areas of nutrient imbalance as between the Midwest and rural Pennsylvania and we also have local imbalance as between the nutrient hot spots of each CAFO and close-by corn fields where too much manure is used and the majority of corn fields that use only chemical fertilizer. When animals were produced close to feed production the individual farmer tended to this important balance. Now there is no attention being given to the key issue of nutrient balance. Just another victim of the industrial revolution in food production. Based on this analysis it is fair to say that the Chesapeake Bay is polluted by meat and dairy production. Other posts and our references suggest that while these products are cheap the quality and humane treatment has also been compromised by the industrial CAFO production process. This entry was posted on March 31, 2010 at 12:40 pm and is filed under Health, Soil, Uncategorized, Water Quality. You can follow any responses to this entry through the RSS 2.0 feed. You can leave a response, or trackback from your own site. Excellent! But I wonder, how did the chicken CAFOs come to be located where they are in the beginning? The concept was developed by Franks Perdue’s father Arthur who started in the Salisbury area on Maryland’s Eastern Shore. In the 60’s as television marketing was in its infancy his son Frank with the help of an advertizing firm in NY developed ads that featured Frank Perdue. This started the idea of the CEO doing direct TV marketing. Delmarva made sense because the flat ground was great for the big equipment that was developed for grain farming. This part is also explained in reference #21 By Johns Hopkins. Perhaps someone else can explain why and how the CAFO concept for chicken spread to the other most environmentally vulnerable coastal plain watersheds and how it spread to other animals.